From the A20 (Limoges) you take exit 35 (Direction Eymoutiers/Lac de Vassiviere) which becomes the D979. You follow this route for about 35 kms towards Eymoutiers. Before Eymoutiers there is a little village called La Veytisou. You will see a tractor/agriculture place on your right. Once you have passed through this village you will take your first left. 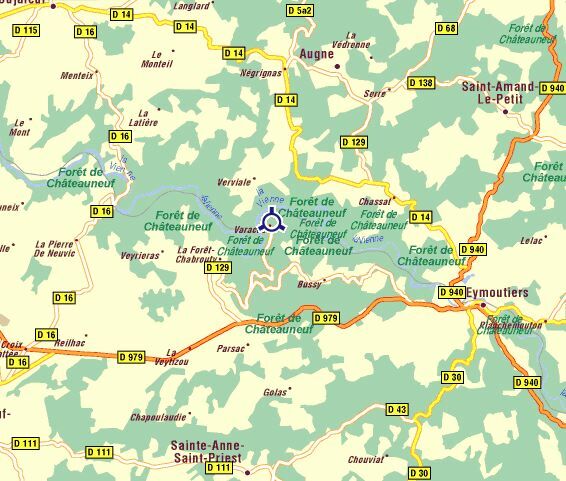 It is signposted the C13 to La Foret. Follow this route and keep to your right towards La Foret. At La Foret you take the first main road to your right. (It is a very sharp turning on the corner of a house). This is the D129. Follow this for 2 kms or so and you will come to a fork in the road and see a sign to the left signposted for La Varache. Follow the road down the valley for 2.5 km and after the black sign for La Varache take the first right up our drive to chez nous.